On October 10, Ambassador Liu Xiaoming and Mme. Hu Pinghua visited the Rolls-Royce factory in Goodwood, Chichester in southern Britain at the invitation of Rolls-Royce Motor Cars. 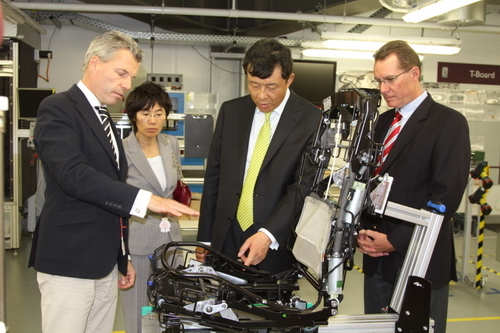 Torsten Müller-Ötvös, the new Chief Executive Officer of Rolls-Royce Motor Cars, welcomed Ambassador Liu’s visit and briefed him on the formation and development of the company in recent years under the management of BMW Group of Germany. Mr. Müller-Ötvös said that with a rapid growth in its export to the Chinese market, Rolls-Royce expects that China will become its second largest market next only to the United States in 2010, and hopes to further expand its business in the country. Ambassador Liu introduced the recent development and market prospects of China’s auto industry, commended Rolls-Royce’s active cooperation with China and expressed the willingness of the Chinese side to facilitate the company’s business expansion in China. Ambassador Liu and Mme. Hu visited the workshops for wood and leather processing and vehicle assembly of the Rolls-Royce factory. Rolls-Royce was established in UK in 1906 and its famous model “Silver Ghost” was known as “best car in the world”. In 1971, after going bankruptcy, the company was split by the British government into Rolls-Royce Motor Cars, which continued to produce cars, and Rolls-Royce PLC, which produced turbines and engines but exclusively held the Rolls-Royce trademark. In 1998, while Volkswagen Group acquired the original Rolls-Royce Motor Cars and the rights to use the Spirit of Ecstasy mascot, BMW Group acquired rights to the Rolls-Royce name necessary to build the cars from Rolls-Royce PLC at £ 40 million, and the two Groups produce Rolls-Royce cars together. 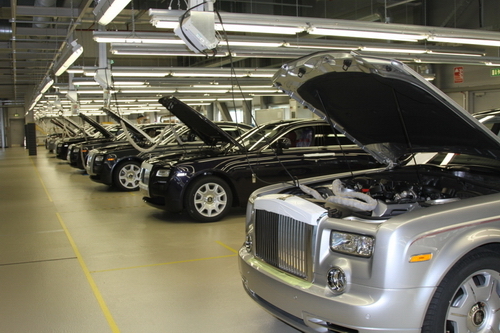 In 2003, Volkswagen Group terminated its production of Rolls-Royce cars and BMW Group set up a new Rolls-Royce factory in Chichester, UK to produce the “Phantom” model. It launched in 2010 the new model “Ghost”.